Light Scent. 3 to 4+ Ft. July flowering. 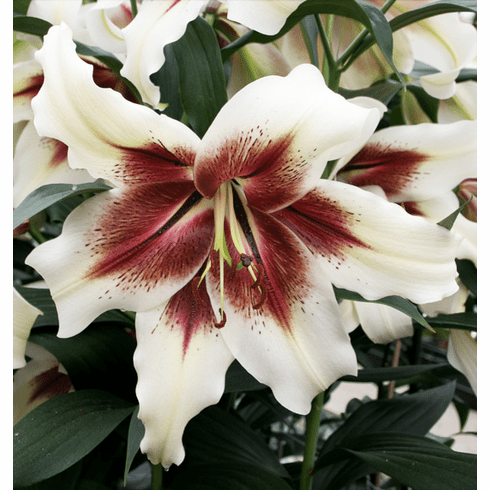 Another first in lily breeding, 'Zeba' is the first lily to be introduced out of the lovely 'Kushi Maya'. 'Kushi Maya' came about by crossing L. nepalense with an Oriental. 'Zeba' is the result of 'Kushi Maya' crossed back to another Oriental. The down side is that the breeder decided to discontinue 'Kushi' while introducing 'Zeba'. All is not lost though as we do have a few bulbs in the field to scale of 'Kushi', and one day she will be back.